Despite extensive restoration, the exterior of the church, with the exception of the tower, is of very similar appearance to that shown in the engraving - by J.B. Ladbrooke in 1820 - on the left. The tower, started in 1633, was left unfinished because, after the Great Fire of London in 1666, the masons departed to rebuild London. It was not to be completed until 1935 when it was built to commemorate King George V's Silver Jubilee. The Church, like so many, was added to through the centuries and much restoration took place. By the middle of the nineteenth century, however, the church had become extremely dilapidated. Major works of restoration continued for 50 years in that century. 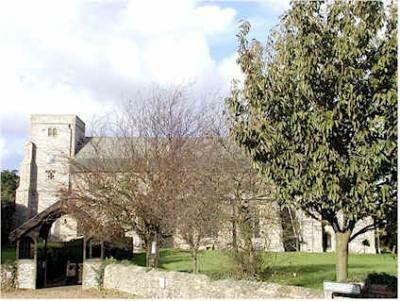 The bell was re-hung in the tower, the chancel was completely rebuilt and the roof of the nave was restored. 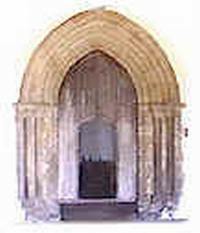 The entrance to the church is through the 13th century doorway which has a fine 15th century perpendicular door with a wicket door for general use. There is a small carving at the top of the door showing a fox preaching to a congregation of geese! The very wide nave has arcades with thirteenth century columns, reset on higher bases when the church was largely rebuilt towards the end of the fifteenth century. At this time the clerestory windows were added above the heightened arcade and the fine hammerbeam roof was constructed. It rests on large corbel brackets with carved heads re-used from the earlier church. The principal benefactors to the church in the fifteenth century were the Miller family, wealthy local merchants. Brass inscriptions to Simon Miller who died in 1464 and his son John Miller 1488 are reset in the south aisle. The centre aisle of the nave showing the rood screen and carvings on the bench ends. These bench ends date from the 15th century and have poppy-heads and carved arms. As well as the three shown above the figured arms include a chalice and three others represent Anger, Drunkenness and Sloth. Although it can be seen that the bench ends have sustained some damage, it should also be noted that great care is taken of these ancient carvings. 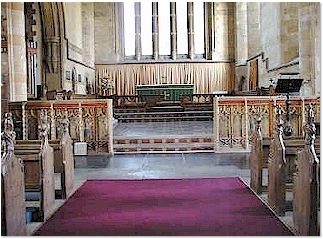 The rood screen (a section showing on the right) was donated by John Miller and his wife Clarice. It sustained considerable damage in the 17th century but is still worth seeing. It is one of the few examples showing Old Testament Prophets rather than the Twelve Apostles. There was much restoration carried out in 1635 during which time the pulpit (left) was installed. The octagonal font (right) is 15th century. The panels contain painted shields. The cross of St. Andrew, The cross of St. George, The instruments of the Passion, the three coronets for the See of Ely, Three crowns for East Anglia and Three chalices for the Blessed Sacrament. There are three bells in Thornham Church. Two in the tower and one in the nave. Of the two in the tower, the larger bell was made in 1865 by J. Taylor & Co., of Loughborough. It has a diameter of 38½ inches and weighs approximately 10 cwt. The bell frame is mounted on massive bearers and its fittings ensured that the bell could be swung through a full circle. The second and smaller bell is one of the oldest known bells in the country, possibly dating from the 12th century. 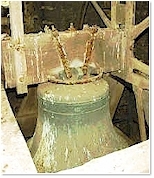 The bell has a diameter of 17½ inches and weighs about ¾ cwt. 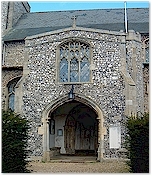 The minesweeper HMS Thornham gave its ship's bell to Thornham Church in 1969 and it is rung only once a year. Each November it is rung to signal the two minutes silence. The ship's flag that accompanies the bell was flown on HMS Victory. On the wall alongside the bell there is a framed photograph of HMS Thornham. You will find many more pictures, some of them quite old and historic, of the inside of All Saints church at Thornham Village - internal views of church and even more of the outside at Thornham Village - external views of church.